Hello everyone. 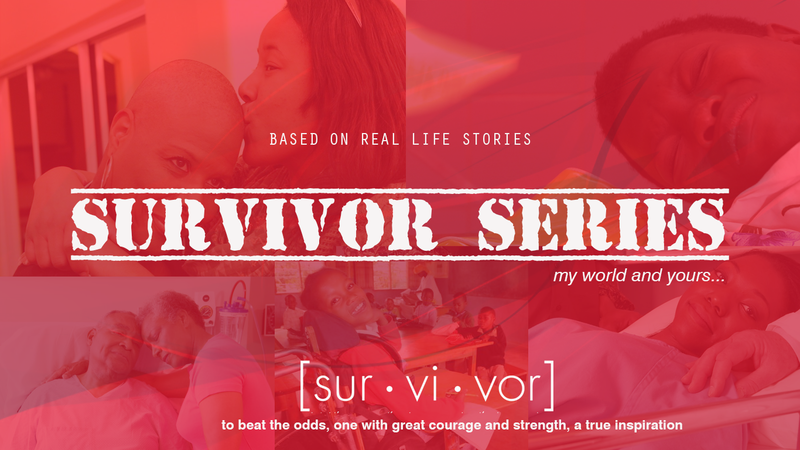 You are welcome to the first of a new series called “Survivor” where we bring to you the inspiring stories of many strong Nigerians who have battled or experienced first hand the battle of a loved one with a terminal health challenge. 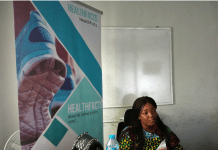 Healthfacts.ng brings to you their story and how they pulled through in order to enlighten the public and encourage anyone out there who might be going through a similar challenge. 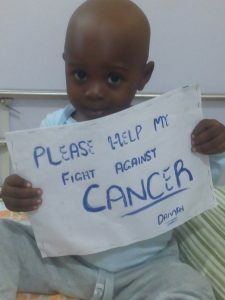 Our Survivor for the month of August is Daivyan Obiajunwa, a boy who was diagnosed of cancer at an early age of 3. 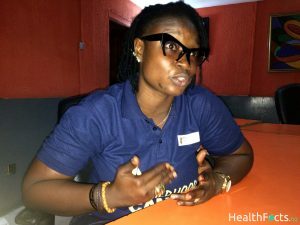 His mother, Matilda Obiajunwa, who runs an NGO that has helped save the lives of many children diagnosed with cancer tells the story. Please, can we meet you? My name is Matilda Obiajunwa. I am happily married with three children. Even though I do a lot of other things, I’d love to be referred to as a childhood cancer advocate. What influenced your choice of being a childhood cancer advocate? I used to think that cancer was a white man’s disease. I thought that even if it happened to Nigerians, certainly not children. Imagine my shock when I found out my son was suffering from cancer. He was initially misdiagnosed twice. By the time it was finally discovered that he had cancer, he was already in stage four. If I knew half of what I know now as regards cancer, maybe that wouldn’t have been the case… because the signs were all there. I feel the awareness is not there enough. During the recovery journey, a lot of Nigerians reached out and supported my son. I feel this is a way I can give back – creating awareness that childhood cancer is real. When was your son first diagnosed and how did it all happen? In 2015, he was misdiagnosed twice. He had episodes of vomiting, severe temperature. That was strange for a very active child that he was. By the time we took him to the hospital, he was first diagnosed of intestinal obstruction. He was at that time a year and ten months. Just as he was about to go into surgery for that, they discovered it wasn’t intestinal obstruction. Then they treated him again for sepsis. After which he was fine.. or seemingly fine. We went home and all was well. After about seven days, his stomach started distending. That was really worrying. We initially thought it was reaction to the drugs but then after a while, we were advised to go for an abdominal scan because his stomach was growing so big. We were then told to go through a process of either an IVU or a ct-scan before we could proceed. We didn’t have that patience because things weren’t looking good with him so we opted for a CT-scan. We picked the results and checked Google. *laughs*… It is really a good thing I can laugh over this now. Then it wasn’t funny. When we were done with our Google search, we had the scary fact staring us in the face. Our son had cancer! It was confusing at first. But we had a doctor friend, Dr. Emeka. He was the person who advised us to take a scan. So he honestly told us that because the case had metastasized to stage four, we were doubtful that the case could be handled here. So we made preparations to fly him out for treatment. What do you think caused the cancer? I hear about risk factors that predispose people to cancer, what risk factors or causes of cancer are there in children? The truth is you can’t really trace for sure what causes cancer in children. Some say the lifestyle of the mother during pregnancy, others say food. The truth remains though: from my research, there is no proven cause of cancer in children. Can you kindly tell us about the recovery process? When we got to India, they had to put him on therapy to shrink the tumour for some weeks before he went in for surgery. After that, he had radiotherapy and chemotherapy. After all of that, he was on close monitoring; he still is. We have to do reviews and follow ups. We have a stretch of appointments for the next three to five years. A child is confirmed totally free from cancer when s/he stays at least five years without a relapse. So we are believing God that God who brought him through and past stage four would perfect his healing. It has been a year now since his last chemotherapy. He is a very active and smart child. What he eats, drinks are still on close monitoring even though we know it is God that does the healing. Let me say this also and I say it from my own experience and what I have seen so far as a childhood cancer advocate. I tell parents here at my foundation: It is not about where you fly your child to during this time. It is ultimately God that heals. I watched Indian children die to this cancer in their own clinics. If they can’t heal their own children, how much more ours? So let’s not forget that, God is ultimate. In the same vein, we have to fulfill all righteousness. There is a reason why there are doctors, surgeons, nurses and all those people… all of them working together to help the child get better. For expecting moms and other moms, what would you say to reduce the risk of childhood cancer occurring to the barest? Well, I advise expecting mothers to be very conversant with health trends (internet and all) so that when there is an issue, you can easily detect it. Expecting mothers should also know that they aren’t only responsible for their lives but for the lives of the children they carry. So smoking, binge eating and unhealthy practices should be totally out of the list for pregnant women. Also for other mothers, watch what your children eat and drink and keep a close eye on them so that you can easily detect any anomaly. Feel free to see a doctor if it is beyond you. 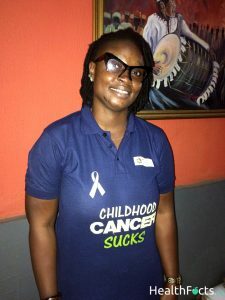 What role do you think individuals, government, and others can play in the curbing of childhood cancer in Nigeria? First, we must realize that this isn’t a lone fight. Those families, children facing this can’t do it alone. We all need to join hands together. 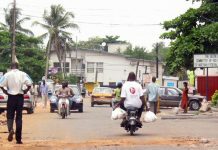 The cultural settings in Nigeria make it difficult for treatments in some cases. A lot of times when children are diagnosed of cancer, the parents don’t want to admit it. They take the child away and never return. You see people telling them to give the child agbo (herbal medicine) or take the child to one herbal home or the other. 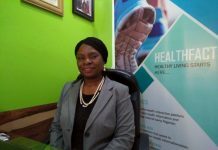 The cancer drugs are so expensive and scarce; some of them aren’t yet approved by NAFDAC. Even in the hospitals, they don’t have all of the equipment needed for treatment. So it is everyone coming together to play their part and reduce the death rate. I can tell you categorically that at least one child dies every ten days in Lagos University Teaching Hospital, Oncology department. Now, imagine the rate across Lagos and then Nigeria, it is really crazy. So individuals, corporate organizations can find families, foundations or NGOs that need their funds and support, help in creating awareness and supporting the cancer journey of these families too. It is a collaborative effort. So how exactly does your foundation operate? We have children’s day walk every year to create awareness around childhood cancer. We have the gold challenge in September where we tell people to go ‘gold’, wear something gold throughout the month to create awareness too. Last year, we had a sporting event to commemorate the event and gifted a few families that had children battling Cancer with monetary gifts. We get our funding from different sources. For instance, we sent boxes out to schools for support and on that day, they brought their boxes and we shared the money amongst the families that were present at the event and in need of it. This year, we would be having another one in grand style this time around. We would have people gather on the 1st of September at the Teslim Balogun Stadium. We would be lighting up candles to remember those who have gone, to support those who are battling and to encourage people that survive to come out and support others. I don’t know why people stigmatize cancer patients, it is not contagious! Everyone has one way or the other had a contact with someone who has battled cancer. So much you have shared. Thank you. Any final words for people battling cancer? Once a family hears their child has cancer, it is not easy. I can tell you that, it is like they are starting a journey which they can’t tell its final destination. Stay strong. Don’t give up. I tell the mothers at the ward, whatever you do, don’t let the children see you cry. Yes, there are times you need to vent out, take a walk and cry it all out and come back for those children. Let them know there is still something beautiful for them to live for. Stay strong! Thank you so much Mrs. Matilda for your time and the warm welcome. For more information about the Daivyan foundation, kindly click here.